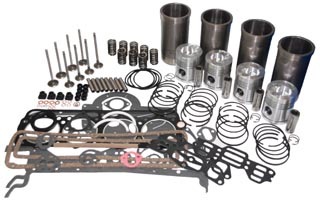 Unless other wise noted most complete engine overhaul kits contain the following: pistons, rings sleeves, wrist pins with clips, piston pin bushings, gaskets, rod and main bearings, intake and exhaust valves, valve springs and guides, valve locks. Basic engine kits do not include valve train parts. Parts listed below are for Case farm tractors only and may not be compatible with other Case equipment.